This project involved the “design-build” of a 1,100-linear-foot educational boardwalk trail through a rare, environmentally sensitive bog on the West Campus (K-12) of the Pocono Mountain School District in Pocono Pines, Pennsylvania. The purpose of the trail was to provide an outdoor classroom setting for school students, as well as to provide public access to this special site. The project was funded by a private foundation grant obtained by the Tobyhanna Creek/Tunkhannock Creek Watershed Association, with assistance from Hanover Engineering. Hanover Engineering staff worked closely with volunteers through the Watershed Association and the School District to construct the trail as a “low-impact” project. A low-impact design was highly desirable for this site due to the sensitivity of the bog environment. An added benefit of the low-impact design was the reduction in materials used resulting in a more costeffective project. The final product was a narrow, ground-level, “floating” trail capable of supporting normal trail volume and use. 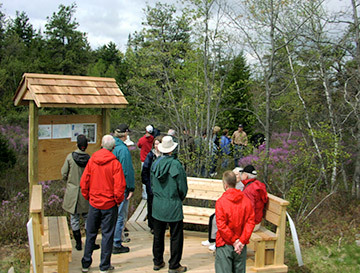 In addition to the trail, a platform with built-in seating and an educational kiosk was also designed and constructed by Hanover Engineering. The kiosk artwork provides an overview of the unique environmental characteristics of the bog site, along with a map of the trail system. Natural cedar lumber, a durable and environmentally friendly alternative to chemically treated wood products, was used for all trail components.